I haven’t blogged about BakedIn Baking Club kits for a while. That was because some people had read the posts expecting to be given the recipes to recreate the bakes themselves. These recipes are exclusively created with and approved by Michel Roux OBE, one of the world’s top pastry chefs, especially for BakedIn. Obviously then it would be very wrong of me to share the actual recipes. These recipe kits used to only be available to members of the BakedIn Baking Club as part of a monthly subscription. Now though, BakedIn have decided to sell the kits to anyone who wants to give them a try. So now I feel I can comfortably blog about them without people being upset at not having the recipes. If you like the look of the recipe, you can now buy the kit yourself! Brilliant news! The only catch though is you only have a month to buy it. The Baking Club kit is sold as the BakedIn Bake of the Month, so is only available until the next month’s box is sent (or until it is sold out, whichever comes first). In case you don’t know about the BakedIn Baking Club, it is one of the best subscription boxes you will ever find. Each month you are sent all the dry ingredients you need for that bake, as well as extra bits and pieces like baking paper, piping bags, testing skewers, butter measures, and of course a very beautifully presented recipe card with colour photographs of each stage of the recipe. You just need to add a couple of fresh ingredients such as eggs, butter or cream. The recipes are great to make with children, and are perfect for any skill level. Any tricky processes are clearly described, making them achievable by everyone. The thing I love most is the range of recipes they come up with. You might have baked something similar before, but the BakedIn recipes are always so much better! For example, last month was a tea loaf, something I bake a lot, but I have never had one anywhere that has tasted as delicious as their recipe did. The beauty about having these kits is that you then have the recipe forever to make again and again. All this costs £8 if you pay per month with postage included in the price, or £7 per month if you pay in 6 monthly chunks. That is a fantastic price for everything you get! 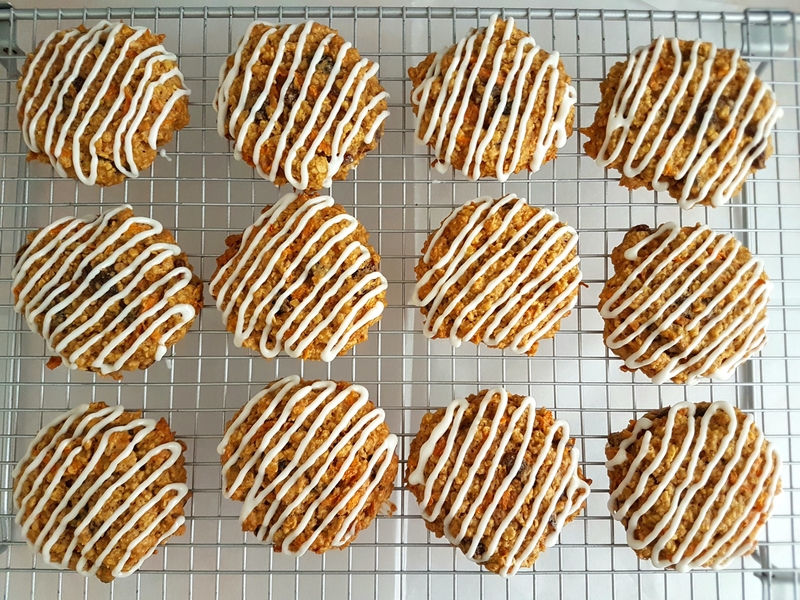 So on to this month’s bake, carrot cake cookies. This recipe is my favourite BakedIn recipe ever! In fact it is so delicious I made it twice in as many days! I adore carrot cake so knew I would love these. They exceeded my expectations by miles though. 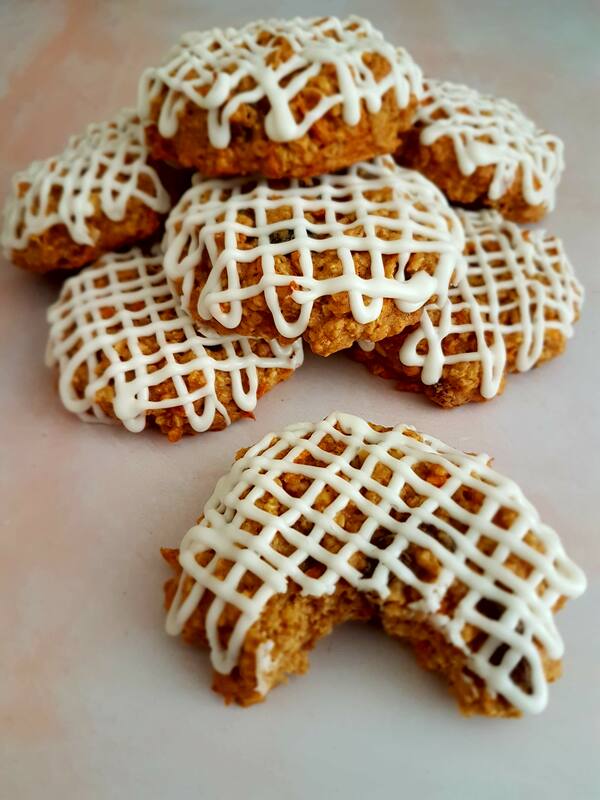 My Other half isn’t a massive carrot cake fan but he adores these cookies! 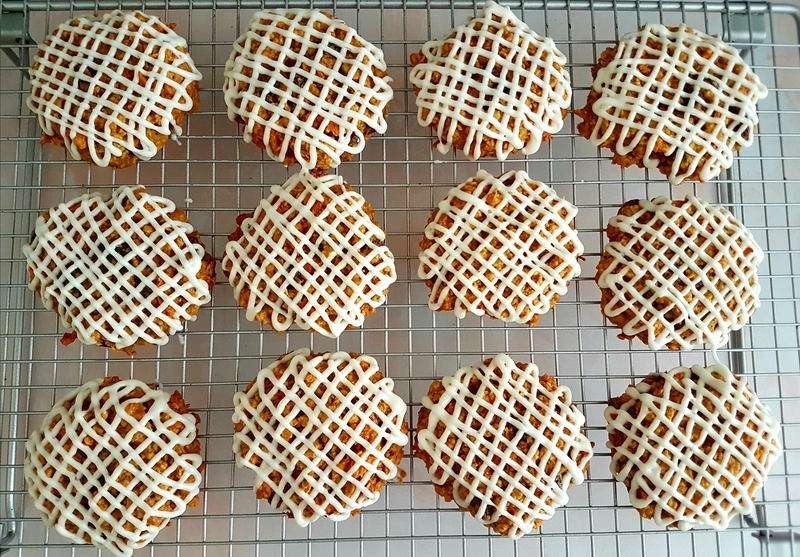 Absolutely scrumptious cookies, crunchy around the outside, soft and chewy inside, topped with an amazing cream cheese icing. 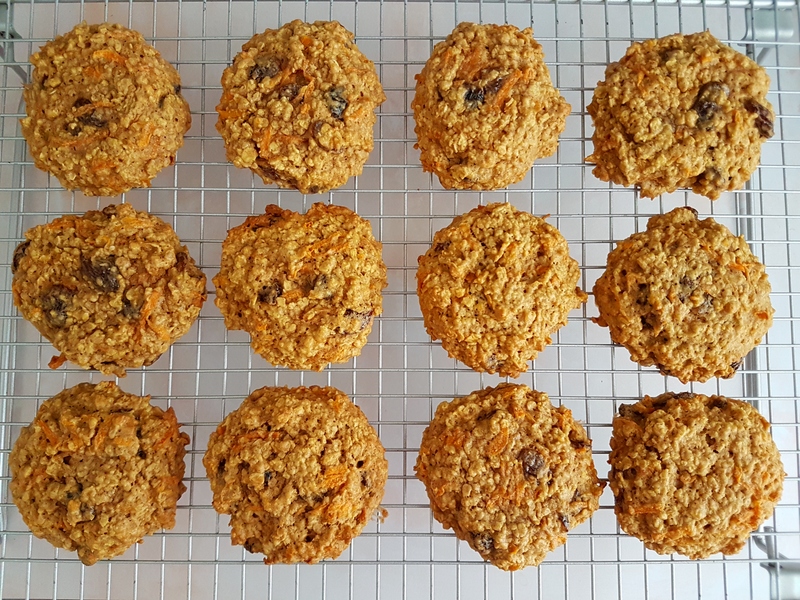 I have made carrot cake flapjacks before (see the recipe for those HERE) but these cookies are my new favourites. (Incidentally, if you want the very best carrot cake recipe my lovely Twitter friend @zoetcm has an amazing recipe on her blog HERE). 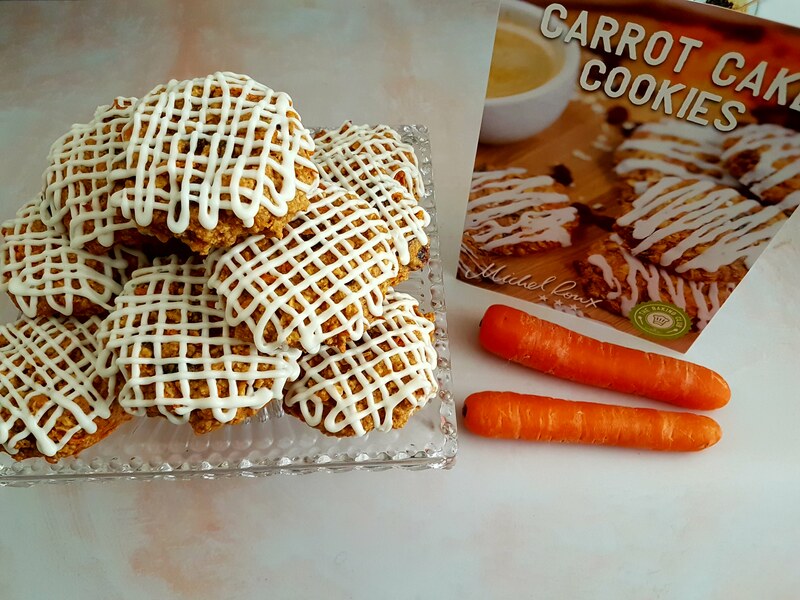 The carrot cake cookies are one of the easiest recipes we have had in the Baking Club. There is literally nothing that can go wrong with these, unless of course you forget to turn your oven on or forget you have them baking!!! They are a nice quick bake so perfect for when you have unexpected guests and want to give them something super scrummilicious. They are also ideal for lunchboxes and picnics. And as I discovered, they are great at getting rid of midnight munchies! (Yes I did sneak downstairs in the middle of the night to have one hehe). I used an ice cream scoop to place my mixture on to the baking trays as I wanted them to all be a similar size. That worked really well. I didn’t flatten them too much as I like chunky cookies. When they had cooled I piped some cream cheese icing on them but had loads left over so went back over them with more. You can never have too much cream cheese icing! The second time I made them, I added a few drops of orange extract to the icing and that tasted amazing too. The orange really went well with the carrot cake flavours in the cookies. I shall be making these yet again today, that is how much we all love them! The recipe makes 12 cookies but they are so addictively moreish they disappear rapidly! If you would like to make these cookies too and have a wonderful recipe to add to your repertoire, you can buy this box as a one-off kit HERE, but be quick… this recipe will only be available until Mid June 2018, or sooner if they all sell out. The box costs £8 plus postage. If you would like to join the Baking Club and receive the monthly recipes with free postage, click HERE. You will be able to choose whether to pay monthly, 3 monthly, or 6 monthly.